• Name Tags for business meetings, dating services, golf clubs, gyms, weddings and parties. • Labels for clothes, cubby holes, etc. for summer camps, churches and elementary schools. • Adhesive parking passes for high schools, colleges, communities, businesses and even military bases. • Organizing and Labeling Inventory, Raw Materials, CD’s, DVD’s, Tapes and much more. Just print and peel off the labels. The labels are permanent, uncoated white. 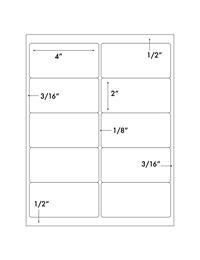 Size of Each Label: 4" X 2"
Distance From Top Edge: 1/2"